What does it take to own a home? MIMA Light shows that a construction site, 22 weeks time and € 20,000 can already be enough. The idea of ​​a small house, customizable in size and features, is as simple as it is ingenious. The result is a functional design sculpture that also withstands a look behind the façade. It takes just 22 weeks from personal design, through production and construction, to your own dream home. Whether on the shores of a lake or in the mountains, the basic concept is adaptable and adapts to local conditions. Individual foundation solutions range from concrete floor slabs or supports to special wood foundations. The wooden small modular house has short construction period due to modular system of building elements. At the construction site, the prefabricated modules are only assembled. For the design of the small units MIMA was inspired by different artists. The sculptural cube seems to float above the ground. It owes this impression to an all-round mirrored pedestal. The other materials shine with noble restraint: Noble metal coating or simple color, every owner can give a MIMA Light a personal touch. Depending on the customer's requirements, 1.2 meter modules will give a total length between seven and eleven, with a fixed height and width of 3 meters. This results in floor areas of 21 m2 for the smallest, and almost 33 m2 for the largest unit. The individual modules are clearly visible to the outside and act like chain links. A flat roof and internal gutters complete the pure geometry. The interior is also reserved. Floor and walls made of plywood boards ground the innovative project. While large glass fronts provide a friendly ambience on the front side, it is also possible to make individual façade modules as glass surfaces. Depending on the location, for example in extremely warm conditions, the glass is made thicker and with higher level of protection. 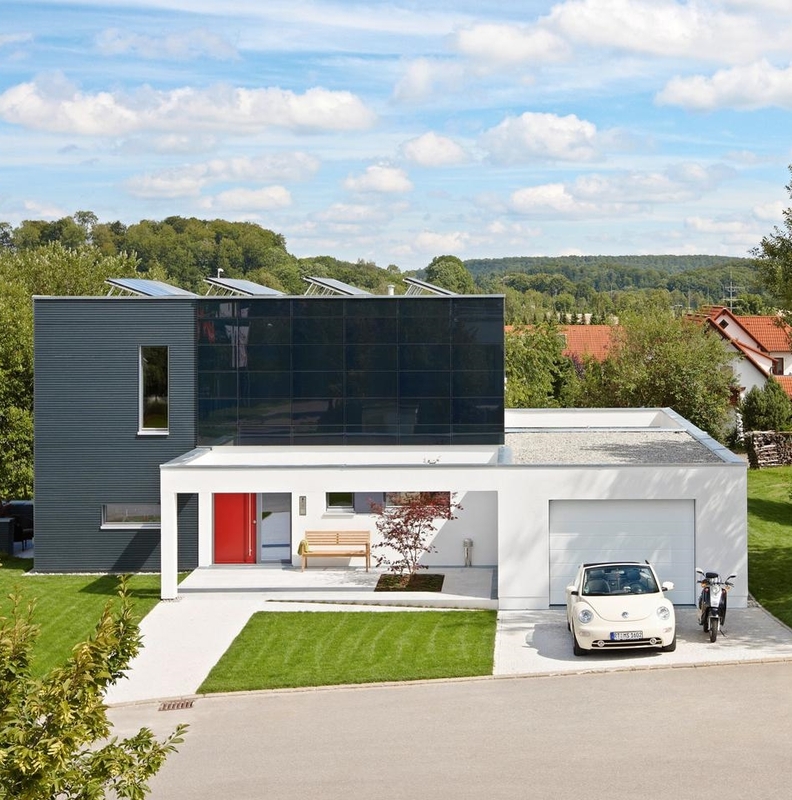 Not only architectural design, but also energy technology puts a lot in this small prefab house. Solar panels are used for the electric boiler, which guarantees the hot water supply. Kitchen and bathroom form a compact module that can be placed centrally or at one end of the MIMA Light small prefab house. Their position is decisive for the shape of living room and bedroom. The compact home opens up new perspectives in tourism as well as in the holiday home market and with prices between € 20,000 and € 40,000 is not only affordable for high earners. The KODA Light Float opens up the opportunity of using urban or countryside waterfront space. The architecture, design and engineering skills combined enable living near a favourite yacht harbour, on a private lake or on an urban canal. 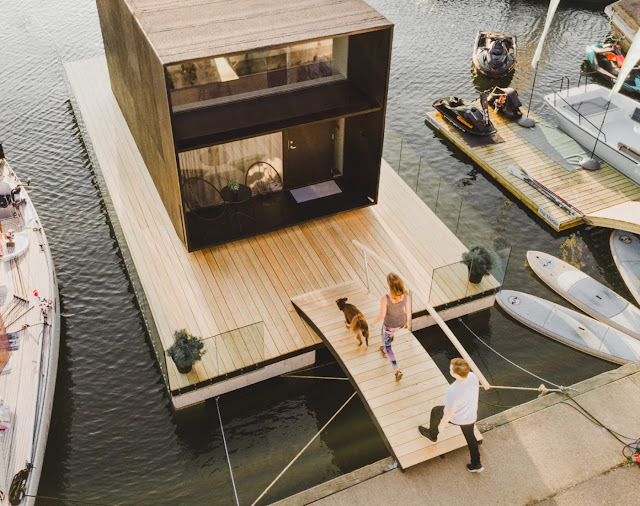 The versatility of prefab modular housing concept makes the KODA Light Float either a harbour café, artist’s studio, not to mention a summer retreat or a fisherman’s dream. With its spacious comfort and high ceilings, the fully equipped small prefab floating home has a facade-sized illuminating window. The floating KODA house gives an atmosphere of a mediterranean villa. Sustainably finished with plywood inside, the KODA Light is as minimalist as it is cosy. The floating terrace creates even more luxury space to be blend into the favourite surroundings. KODA is a factory-built house and delivered as turnkey. A standard equipped KODA Light includes an openspace living room, a full-size sleeping area, a shower room with toilet, a kitchen and a wooden terrace – all that on spacious, yet compact 25.8 m2. The KODA Light has maintained its insulation and strength for year around living in heat and frost, while enabling stacking two units of its own kind on the roof. The small prefab floating home KODA Light Float offers the opportunity of choosing the most suitable exterior finish as well as the terrace and border materials to your environment. 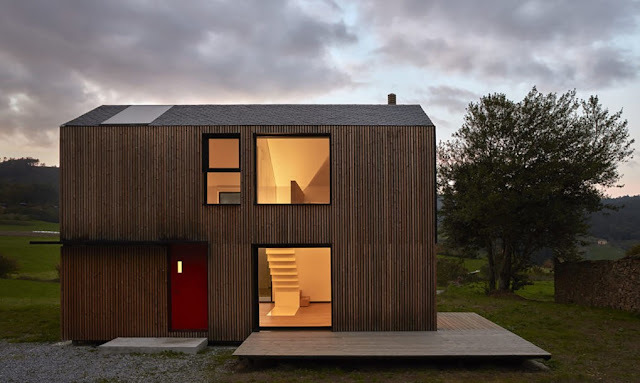 The first being either plywood or timber, the latter offering options between spruce terrace and pine border, or larch terrace with glass border. The 14 x 10.50 m building consists of five modules. Walls and ceilings were made with wooden surfaces and additionally covered with HPL panels in the wet area. The façade consists of HPL panels. As insulating material wood fiber insulation materials were used. Advantage of the solid wood construction: With the same thermal insulation, the walls can be constructed 6 cm thinner. In a time of constant change, the creation of modular building units is becoming increasingly important. Modules from Russ Holzbau und Technik offer growing space as an optimal solution for changing needs. The modular building surfaces are adapted to the respective needs by extending or reducing additional modules. Regardless of where you are, you can also stay flexible: whether it's a living module, office module, parterre module or back-up module, you can work and live wherever you want. And if you change your location or place of residence, then take your module with you. Further you will find individual building solutions for offices, residential buildings and sales rooms of Russ Holzbau & Technik. Passengers at Terminal C of the airport Berlin-Tegel have access to a new lounge. The special feature: the three-storey modular building was built from steel modules by Cramo Adapteo in just six weeks of night installation. The fronts of the modules are glazed over a large area, underlining the cuboidal structure of the serial elements, while the lounges offer generous views. The new lounge at Terminal C of Berlin's Tegel Airport, which is close to the city center, proves that modular construction is suitable for functional and fast building projects, yet not neglecting design and comfort. Cramo Adapteo, part of the Finnish Cramo Group, placed its prefabricated modules on the apron of the terminal in just six weeks. Since the erection had to take place during the running of the airport, the assembly could only take place at night. To the outside, the building retains a functional character that matches the context, to which the modular design is clearly assigned. The steel construction of each element is visible on the façade, because the individual structures optionally frame large-area glazing and the rooms behind, or outdoor spaces and access area. From the inside, the glass fronts allow for sweeping views. The lounge areas themselves are designed to meet comfort and service requirements for stays between flights. On the ground floor of the three-storey terminal building there is a reception area and a dining area. In addition to dining tables and chairs, work tables are also available, each equipped with sockets. On the second level comfortable seats were placed directly in front of the panoramic glazing, so that the handling of the aircraft can be observed in the first row. On the third floor is a smoking lounge with ventilation system. The exit to a roof terrace is also possible here, from where takeoffs and landings of the aircraft can be experienced in a more exposed position. In addition to the transparent interface, which can be shaded by centrally controlled blinds, a generous sense of space is generated with a clear ceiling height of 2.75 m and partially half-height interior walls. Circumferential LED strips at the connection to the ceiling contour and stage the volume. The designed as heating and cooling ceiling space closure ensures the appropriate air conditioning, the supply takes over an air-water pump with MSR technology. Part of the security concept is an escape staircase, fire protection measures, emergency lighting and door monitoring. The close cooperation of a modular construction company, a housing association and an architectural firm is due to the construction of several residential modular multi-storey apartment buildings on the modular principle and in steel modular construction. In a relaxed urban planning arrangement on a newly developed, inner-city plot in Bochum, for example, three Point houses were created, which want to contradict the uniform appearance and repetitive, shapeless image of serial construction. The Essen-based office Koschany + Zimmer Architekten KZA dealt with the modular construction at an early stage. After a first project in Dortmund, which the architects developed together with the system construction company Alho from Friesenhagen, the cooperation was continued in Bochum. On behalf of the housing company Vonovia, three 4-storey Point houses in the midst of generously designed open spaces were realized. The participants regard the applied modular principle as advantageous for the housing industry as well as for architects and planners. The Modular Housing Kit developed by KZA and Alho consists of individual module types. These include, for example, a living room and a kitchen, a bedroom with a hallway or a nursery plus a bathroom. From this matrix - a canon of different modules - the apartments are custom-made for the respective location and according to the desired apartment key. Afterwards, the house is created out of this individual mix of apartments. "Normally, architects tend to work in the opposite direction - from outside to inside: there is an urban planning situation from which the building is conceived in its cubature and fitted with floor plans developed from it," explains architect Axel Koschany. "Modular construction is the other way around. It starts with elaborate floor plans - in the end the most important thing for the future residents. Even the most similar apartment types are almost never forced into one and the same cubature due to the different local specifications." For example, three modular houses, each with 14 residential units, were built in Kaulbachstraße in Bochum in the course of an inner-city rehabilitation measure. As an urban development reaction to the adjacent to the north side 2- and 3-storey neighboring buildings was staggered in coordination with the city. The mezzanine floor jumps back 3 meters on the 4th floor and creates spacious roof terraces. The return could be agreed with the modular design, since this only one module had to be omitted. The systematics of the modular structure remained otherwise unchanged. The modules are on 17 x 19 m base and 12.5 m high, with 7 one-room, 3 two-room, 2 three-room and 2 four-room apartments, user requirements are covered. The apartments are designed throughout to be barrier-free and wheelchair-friendly. The buildings are centrally accessed via a single-flight staircase and lift system. All apartments on the 1st and 2nd floor have prefabricated balconies, and the apartments on the 3rd floor have rooftop terraces. Arrangement of freestanding Point Houses ensures a varied appearance. The funnel-shaped outer space zones leave room for differently designed open spaces. Green tenants' gardens, playgrounds and other dwellings are planned here. Each building consists of 43 room modules. These were manufactured at Alho plant for seven weeks and under ongoing quality controls. At the construction site, the modules were ultimately assembled in seven days per house. The entire construction period of the three modular buildings was - after the ground was prepared - 20 weeks. "The modular construction can always exploit its advantages if the structural units that are as constant as possible are repeated. That's why we talk about serial modular construction. So that these module types are not built into uniform houses, we work together with architects like KZA. They bring creative input by playing with the building blocks and exploiting their potential in terms of design," explains Michael Lauer, architect at the multi-storey building competence center at Alho. 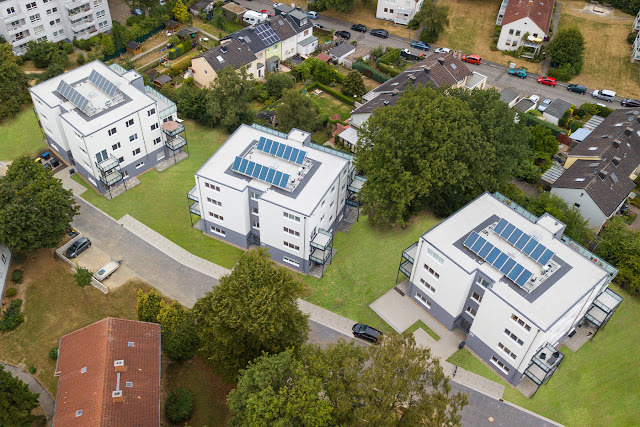 The projects in Dortmund and Bochum are the first of a series of residential construction projects that will be completed with the developed modular system later this year. The project partners are planning to further optimize the system and to expand new components, such as new module units. In Bochum, an exemplary modular construction project proves that series and individuality are not mutually exclusive. On a newly developed, inner-city plot, three modular Point Houses have been created with a loose, urban arrangement and a staggered cubature. As one of the first manufacturers of prefab modular buildings in steel module construction, ALHO offers sophisticated solutions in multi-storey housing construction. For the housing company VONOVIA, the company is currently (2018) realizing a series of residential buildings based on a modular system. The concept was developed together with Koschany + Zimmer Architekten KZA from Essen. Instead of developing the building out of the urban situation, the process of serial construction begins with the smallest scalable serial element, the module. Depending on the room requirement, these individual elements are put together individually. This is how well-designed floor plans and a large range of cubatures are created with modular prefab units. The ensemble of the three Point Houses is already the second housing project that was realized together with KZA. It was created in the course of an urban development densification in Bochum. The buildings are four-storeyed and offer space for 14 continuously accessible housing units of different sizes. There is no basement, but all apartments have a sufficiently large storage room and on each ground floor a technology module is arranged. Overall, the Point Houses are made up of 43 room modules. They were manufactured in the factory within seven weeks under strict quality controls at ALHO and installed at the construction site per house within seven days. The total construction time of the three buildings was just under 20 weeks after the ground was prepared with the floor slab. Contrary to popular belief that modular buildings are boring, the architects were able to make the three residential buildings in Bochum exciting: With the fourth floor projecting back, the design responds to the two- and three-storey neighboring buildings adjoining the north side. At the same time, the staggering of the building cubatures visually revives the facades. In terms of urban planning, the arrangement of the Point Houses, which is rotated towards each other, creates a sense of relaxation: funnel-shaped interspaces that provide space for differently designed recreational areas - from green tenants' gardens to varied playgrounds. 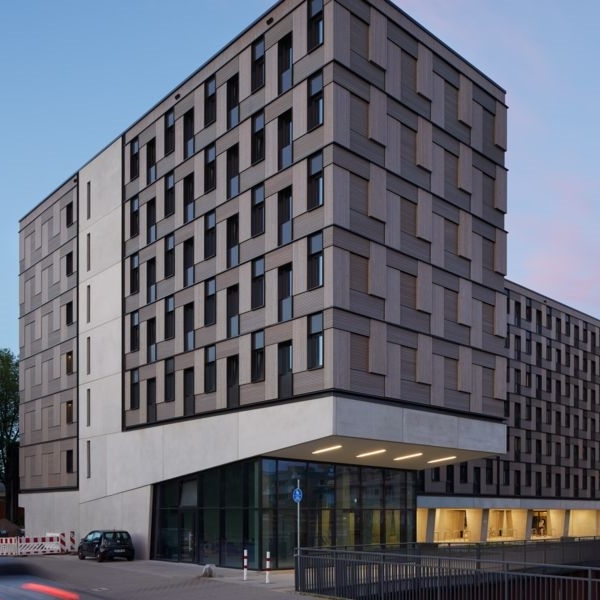 The prefabricated cross laminated timber modules of this student dormitory in Hamburg were developed in close cooperation between the architects of Sauerbruch Hutton, the client and the module manufacturer Kaufmann Bausysteme. A manageable number of design details and the restriction to two module types have made this an efficient as well as inexpensive building possible. For the time- and cost-efficient realization of the "Woodie" dormitory in the Wilhelmsburg district of Hamburg, the client's decision was made to involve a wood module manufacturer directly after the architectural competition. Following the direct commissioning, Kaufmann Bausysteme, together with the architects and structural engineers at Merz Kley, set about optimizing the area of the apartments. The definition of the performance limits was essential, which ultimately led to the module builders being responsible not only for module production but also for the directly adjacent trades: the construction of prefabricated concrete floor structures, the production and assembly of all larch wood facades and roof waterproofing. The resulting benefits include fewer and more precise interfaces as well as subcontractor workflows that are clearly tailored to the modular design, ultimately resulting in more quality, fewer defects, shorter construction time, and therefore cost-effective solutions. 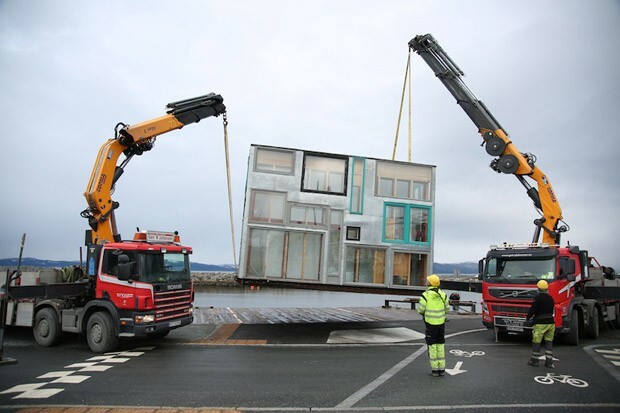 All modules were prefabricated complete with interior fittings, finished bathrooms, windows and doors, stored temporarily, packed in a watertight package, delivered to Hamburg just in time, and immediately lifted to the correct position with a crane. An intermediate storage on the construction site was not provided, not least for reasons of space. A maximum of four modules could be produced per day. The serial production of the modules on a kind of production line brought numerous advantages in terms of accelerated assembly time and a short construction time. Added to this is the fact that assembly processes in workshop conditions and on the ground are generally cheaper and faster feasible than on site. Even more important, however, is the higher quality and precision achievable thereby, without which a modular construction of this type would not have been feasible. On six floors, 100 metres in length and made of solid wood, 371 student flats are strung out in the district of Wilhelmsburg in Hamburg. This makes "UDQ" the biggest timber student residence in Europe and the tallest timber building in Hamburg. 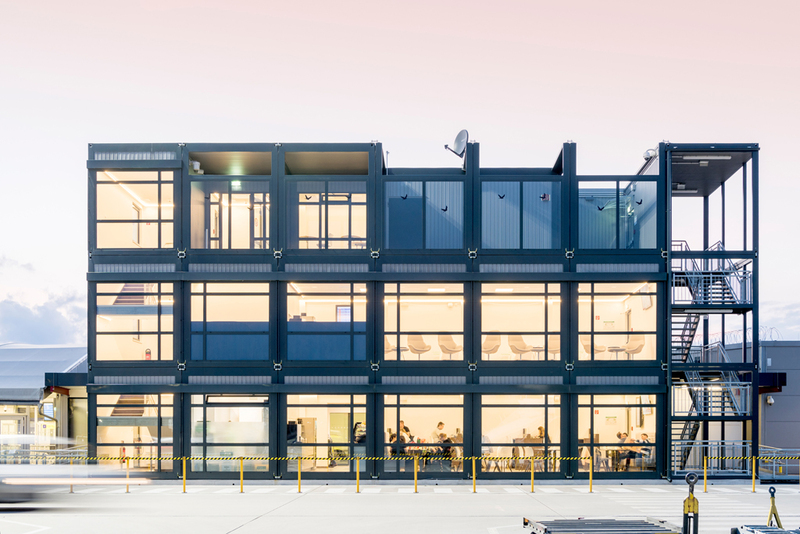 Inspired by the stacked containers in the Port of Hamburg, “UDQ” is made up of prefabricated timber modules that are stacked on top of and next to one other. The whole construction sits on a base of reinforced concrete. Each of the 20 m2 apartments is fully furnished – with bed, bathroom, built-in wardrobe, kitchenette and folding table. Where necessary, single modules can also be combined to create larger apartments. Effective sound insulation is essential on a project such as this. That is why Getzner was brought on board as experts by contractor Kaufmann Bausysteme GmbH. To prevent sound transmission between the apartments, the individual modules were bedded on Sylodyn® from Getzner. Timber was chosen as a building material due to its ecological properties and the warm interior ambience it creates. The modules were pre-fitted with Sylodyn® linear supports at the factory for reliable soundproofing. "Sound mainly propagates through the flanking of the modules. Using elastic bearings, means we have been able to almost completely eliminate sound transmission between the individual modules", explains Hendrik Reichelt, Project Manager at Getzner. The project of a minimum expandable living unit: LIVINGBOX has been developed at the Laboratory of Building Design of the University of Trento (Italy). It can be used as a minimum dwelling for two people (40.50 m2) or as a hotel room (18 m2 + optional spaces) finished in every detail: interior finishing, furniture and technological systems. built as so to verify the real building possibilities. It was displayed in Milano (Italy) at beginning of October 2013 at the “MADE EXPO 2013”. The prototype was transported by 2 trucks from Roma to Milano to Campobasso (more or less 1500 Km) for testing the effective transportability and we could verify no inconvenience or crack on the interior and on the furniture. This is also a real demonstration that it is earthquake resistant building. 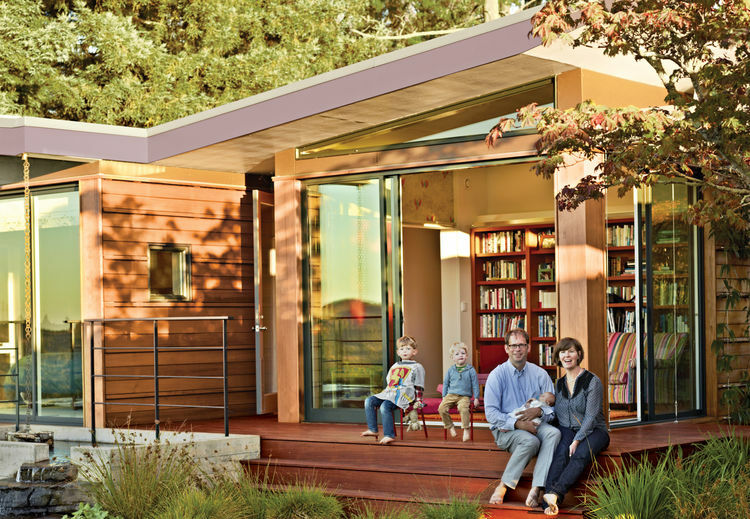 As number of children increases, modular home grows larger - and later smaller again. Living as flexible as life would have to be: a house that grows with increasing numbers of children and shrinks again when family members move out. Modular houses are a modern trend in the field of prefabricated construction. A family changes over the years. First, two people move into a house, then a third, maybe even a fourth person is added. More space is needed. Years later, a few residents gradually move out again. In the end, maybe only one will stay behind - and less space is needed again. Homes that take part in all these situations would be nice - and they already exist: Thanks to their modular design, buildings can grow or shrink. The individual configuration of products is becoming increasingly important in many areas - and the trend is rising. Horst Wildemann, a professor at the Technical University of Munich, is an expert in serial construction and prophesies: "What has long been the norm when buying a car will also prevail in the home market." But that goes far beyond the individual planning on the computer according to the wishes of the clients - it goes all the way to future with modular extensions. District in Trondheim concentrates young architects, students and artists who build their own homes and buildings. On one of those days of blue sky and intense cold, typical of late winter in Norway, I walked a short distance in a district in the center of Trondheim. The area where 240 people live is somewhat peculiar and is different from the rest of the country. In the kindergarten built in a car shop, I found two sheep eating grass and I saw, through the large glass windows, a group of children snacking on round tables. In the district there are also art installations, graffiti, prefab sustainable homes built by the residents themselves and a sense of community and belonging. I'm in Svartlamon, an experimental ecological zone - unique in urban planning in Norway. 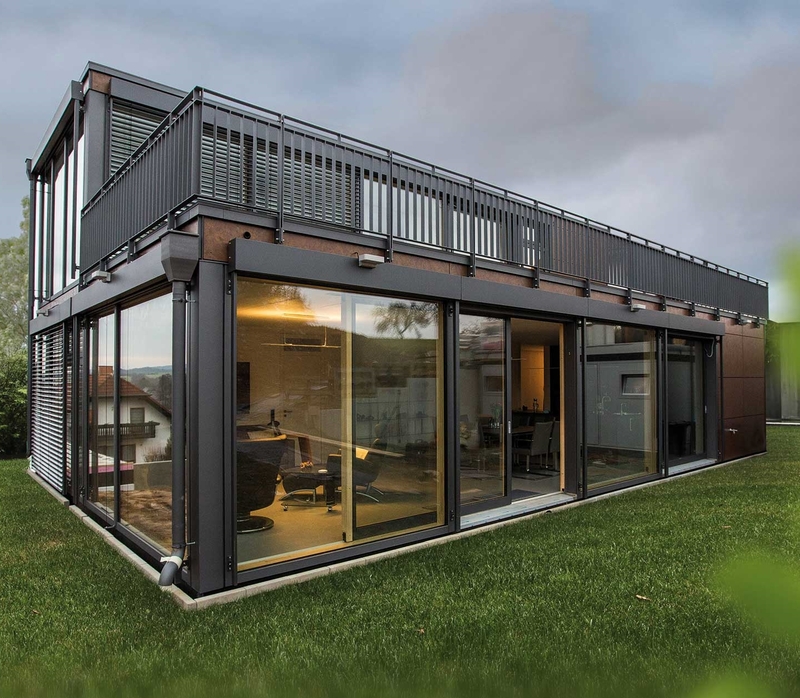 Given the homeowner´s need to minimize all on-site work and construction time to as low as possible for this modular prefab annex to weekend house, prefabricated structure was considered as the best cost-effective and sustainable option. The modular prefab annex includes two bedrooms, two full bathrooms and a large terrace for common use. Prefab modules has an important constraint in their design, the dimensions of prefab elements could not exceed maximum dimensions for truck transportation. Architects planned prefab modules measuring up to 2.4 m by 7.2 m, the standard maximum size of a freight truck platform commonly used for building materials delivery, which also perfectly optimized the use of construction elements and metal sections for the frame and structure. The entire prefab module was put together in the controlled environment of remote workshop, with internal plumbing, electrical installations, light roofing, as well as preliminary ceiling, wall, and floor finishes in the bathroom spaces. On site, the ground work had been done and the concrete foundations had been prepared to receive the modular prefab annex. Once there, the prefab modules were assembled and installed, windows and doors put in place, bathroom accessories, lighting, and fixtures installed, and exterior natural stone was applied, before the final finishes and details were attended to. 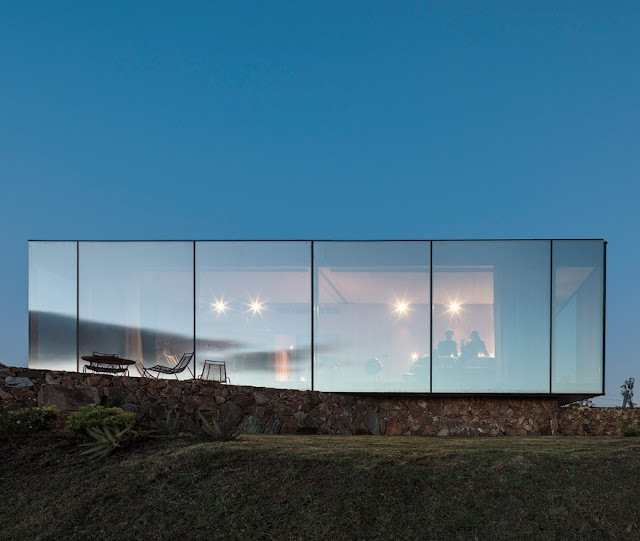 Sliced logs and mirrored glass form the facade surfaces of these prefabricated cabins designed by architects from MAPA, which are located in a beautiful vineyard in Uruguay. 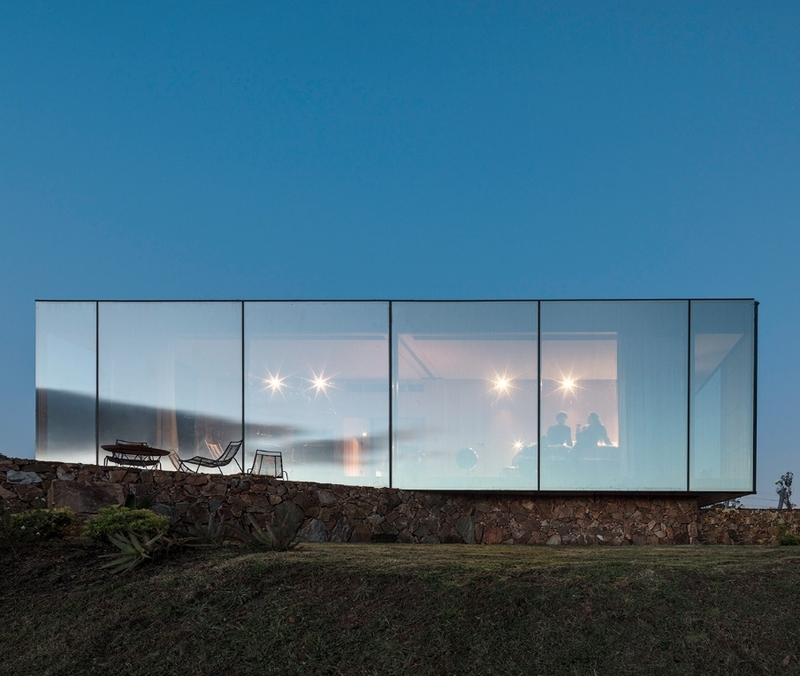 The mirrored glass prefabricated cabins stand on the Sacromonte vineyard with an area of 101-hectare. The vineyard is set within a picturescue valley of dense green grassland crossed by water streams. Local land owner wanted a hotel that "combined architecture, productive land, hospitality, and landscape", which MAPA with offices in Brazil and Uruguay, helped to create. 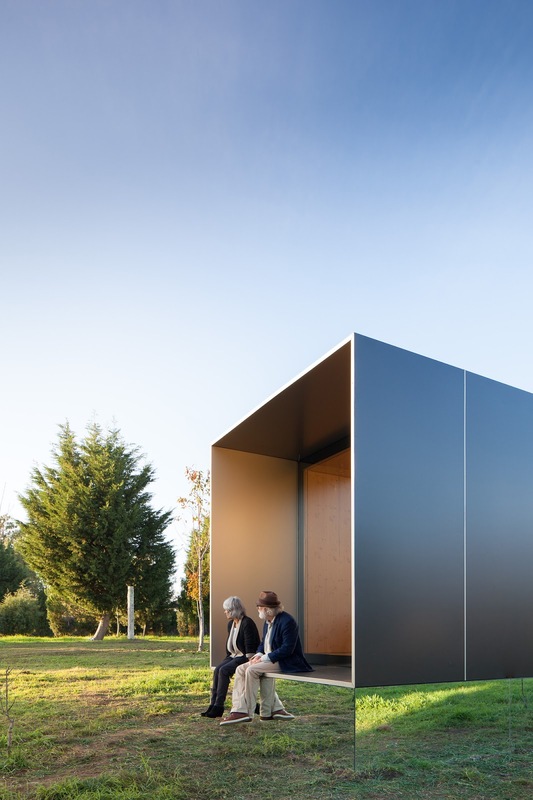 The Sacromonte Landscape Hotel comprises 13 prefabricated cabins placed at various locations throughout the valley so that guests can see and enjoy unique and beautiful perspectives and views of the verdant surroundings. 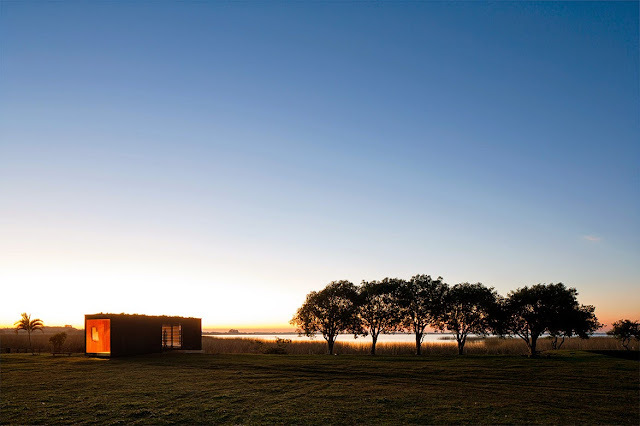 Each steel-frame prefab cabin was assembled in a 10 weeks in Montevideo and after the off-site construction being complete the units were transported 200 kilometres to Maldonado. 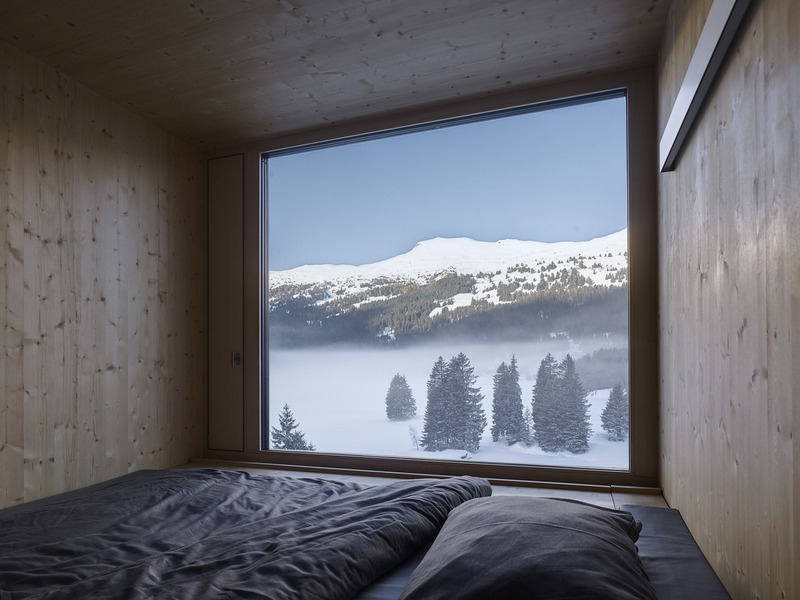 "Prefabrication process appears as an ideal solution if you want to achieve high levels of comfort in remote areas", architect Sebastian Lambert told. MAPA has completed several prefabrication projects. The architects placed a pair of prefab guesthouses in Brazil, on a historic coffee plantation, and has designed a prefab dwelling in an olive grove in Uruguay. While the prefab cabin's front facade has been crafted from modern material, mirrored glass, its rear elevation is built from stacked wood logs meant to emulate and reflect the appearance of classic woodpiles typically found in local rural settings. The natural stone bases that used for support of the prefab cabins are erected on building site, shaped to perfectly suit each individual cabin's features of specific plot of land. Cabins roofs have also been covered with appropriate to the landscape camouflaging greenery, and outer peripheral walls feature slatted custom timber sliding screens. Internally the 60-square-metre prefab cabins completed with a fireplace, cosy reading nook, and a living area with windows that face directly onto the surrounding landscape. The valley will also have a wine tasting hilltop terrace, a restaurant, and a pitched, open-air chapel. Sacromonte is an invitation to meet with the remote nature and the world of fine wines, where sophistication and originality coexist in a new landscape experience. Its lands of more than 100 hectares (250 acres) are located in a privileged location: the wild mountains of eastern Uruguay. Equidistant from Punta del Este, Jose Ignacio and Pueblo Garzon, it forms a unique ecosystem of enjoyment, of which it is part with its own spirit. Sacromonte is a landscape. It is a field of relational forces, of old intensities and new impulses that coexist in a new unprecedented entity. Thus, nature, production, infrastructures, buildings and energy constitute a field of stimuli to discover, a field of experiences. It is a field of forces inter-related between veloces intensities and nova impulses that constitute a unit of precedent. In this landscape young vineyards interact that adapt to the characteristics of their soils, a hill from which to understand the landscape, green areas of meadow, two reserves of natural water and several streams that run through the valleys surrounded by dense native vegetation. The contemporary explorer is in charge of traversing them and drawing his own script through various scenarios of which he is co-protagonist next to the landscape. more than 200km in a single day. When leaving the city behind, the rooms stop being, to become refuges of landscape, stop being objects to become experiences. In its modular metal structure, which combines steel framing and light steel framing, the simplicity of construction and the efficient use of materials are paramount. Their endings are simple and forceful, the materials are used according to their nature. In contrast, the walls received by the prefab modules are simultaneously built in place with local stones that take on various organic shapes and are adapted to enable each implantation. They are complete with circular pools that integrate a new sensory experience of the landscape. The spaces are organized in a sequence of longitudinal layers of different thicknesses between which life develops. The back facade is composed of a stack of wooden trunks that recalls the stacks of firewood typical of life in nature. The next layer houses the wet areas of bathroom and kitchen, a wood stove and a deep hole ideal for reading a book or a nap sheltered in the landscape. Separated by a wooden plan, it follows the main bedroom, living and dining room, which opens completely to the landscape it faces, being part of it. The frontal facade is made up of a mirrored glass that covers the prefab cabin with an almost magical effect, positioning it in a tense boundary: between the camouflage and nature and the unreal brilliance of today's technology. Trend-oriented, authentic and natural. When a sports hotel is reduced to the essentials, a feeling of freedom in the face of life and an unconventional architectural concept arise. The long, narrow building perches on the edge of the steep terrain with the mountain forest in the background. The two slightly angled elements of the building follow the shore of the Heidsee. The front of the building with lobby, bar and restaurant is in a cozy way aligned to the entrance of the Rothornbahn and forms the common center of the hotel. Around four more floors with a total of 96 rooms are compatible with this massive ground floor floor, where the winter sports hall and the large bicycle room are located. The modular hotel combines the atmosphere of a mountain lodge with the liberating feel of a motorhome and the functionality of a ship's cabin. All rooms are oriented to the west, towards the water and remind of the picture of a VW bus: A park at the lake opens the tailgate and feels a sense of freedom. A large wall-to-wall bed and a room-high panoramic window with ventilation wings reinforce this impression. The rooms are optimized to only 15 square meters. The ceilings, floors and walls are built in modules of unfinished natural plywood: columns, partitions and interior fittings, all in one. The arrangement of the rooms next to each other creates a double wall effect, which also ensures better sound insulation. The bathroom is installed in a multifunctional box. The fully equipped room modules were prefabricated, allowing for precise execution and rapid design and assembly. Modern technology and design without influencing come together here, of course. This is obvious both inside and out. The metal façade of the foundation with a vertical design surface, the abstractly arranged window slots and the glazing from the floor to the ceiling testify to thriftiness. On the façade of the four floors of the rooms, the individual modules are highlighted by the protruding metal cladding, and the building is clearly a wooden structure with vertical larch strips, untreated. The special feature of this luxury modular hotel are its individual rooms, which are inspired by the image of a VW bus. A large wall-to-wall bed, a floor-to-ceiling picture window with narrow air vents and a deep sill and a compact, box-shaped bathroom add to this space. Countless well thought-out details make the rooms special. The heating element in a corner to dry the clothes. The bed can be used as a sofa for watching TV and relaxing and an automatic folding device simplifies this transformation. The standard rooms, each the width of a bed, are optimized to only 15 square meters. There are also 4 rooms without barriers and 28 rooms with three beds. Each cabin is designed as a room module made of spruce planks, which form the columns, the room dividers and the interior in one. The effect of a double wall is achieved by placing the rooms next to each other, which also ensures better sound insulation. The prefabricated modules are suitable for this design and offer the decisive advantage of high-quality workmanship as well as construction and assembly on site. Place where the fire is made. House. Group of people living together. "The house is the coat." "The house is a dwelling machine." English clients, in love with Asturias, decide that their second home will be industrialized. Produced during four months in a factory in Madrid and transferred to its final location at 600 km, crossing the Cantabrian mountain range, where it will assemble in only 5 hours. Finally, the black slate roof is placed by a craftsman of the zone. Technology and tradition in the days of Brexit. The project is developed in two levels, with a simple program that groups the installations in one of the three modules of 2.15 x 5.30 m that conform it. The metal staircase is the central element of the dwelling, around which the program runs and which dialogues with the chimney suspended from the living room. The upper floor contains the two rooms, separated by a light polycarbonate wall that sifts the light. A prefab home for an English landscaper and his family, actively developed with clients, involved in the project from the very begining outset, showing absolute respect for the rural environment where it is located. A wonderful complex formed by an "hórreo" and a traditional dwelling, in process of rehabilitation is tourist accommodation, that still keep alive the project. New ways of conceiving housing, a high quality product, that tries to approach to the automotive and aeronautics industry, that allows a future growth of the building offers a way of using the space in a much more dynamic, versatile and rational way. The fact of produce our prefab homes in a factory and transporte them to the site completely finished, apart from get more control over the quality of work, means several advantages which are listed below. 1. Costs and lead time reduction and therefore faster benefits [4 months]. 2. Higher security at work and reduction of potential working risks. 3. High quality construction, meeting the requirements of the CTE and energy Efficiency. 4. Different materials option. Adaptable and exportable housing [Growing Houses]. 5. Option of relocate the house in other place [Mobility]. 6. Real sustainability from the way of building and used materials. Optimization and Recycling. 7. Noise, discomfort and waste reduction. The main work is done at the factory. 8. Project, design, manufacture and assembly of the prefab house. 9. Structural Safety and precision, overall in earthquake zones. 10. Accessible Housing and elevator option. The system used for the housing construction is a modular three-dimensional components system manufactured in assembly. The main structure is composed of galvanized steel sheet elements with rigid joints solved by welding, fulfilling all requirements set by the CTE. The modular construction system manufacturing assembly line not only seeks to optimize energy resources, human and material, but also to optimize in benefit of customization and adaptation of the building. Fiction Factory, once a theater scenery company, has expanded its design and construction initiative to include a prefabricated modular home, the Wikkelhouse. The design utilizes high strength cardboard as a main element of the structure. During the production process, the house-shaped mold is wrapped with 24 layers of cardboard — leading to the origin of the structure’ name, which in english loosely translates to ‘wrap house.’ Using the same main components in each structure, the design of each home can differ greatly in terms of overall size and individualized features. Since Fiction Factory’s initial introduction of Wikkelhouse, the company has successfully installed the structure in various different environments — both natural and urban. 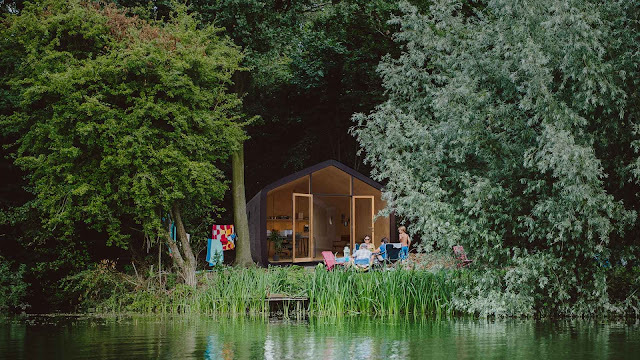 One of Wikkelhouse’s natural application remains in London’s Amber Lakes, a nature reserve close to the bustling city. Urban applications include the house’s installation in Rotterdam Red Apple Marina floating alongside the boats and as an office for OVG Real Estate Services in Amsterdam. The company has also experimented with placing the lightweight structure of prefab modular house on a rooftop of a former coal storage facility in the Hoxton Docks area of London. Wikkelhouse is made up of 1.2 meter deep segments that can easily be connected and disconnected. The modular setup makes the house highly flexible. Add extra segments for extra meters. Create your own floorplan. Change it later. Truly anything goes. Each Wikkelhouse is tailor-made by specialized craftsmen. Extra windows, different finishings or your own color scheme - you can make Wikkelhouse even more to your liking. Wikkelhouse is sustainably produced and made of materials that have minimal impact on the environment. Moreover, the segments can be reused over and over again and are 100% recyclable. With a weight of only 500 kg per segment, Wikkelhouse doesn't need a foundation and can be placed anywhere you want your prefab modular house to be. On the beachside, in your backyard or even on a rooftop. Looking for a change of scenery? Just move the house to a different spot. Located in Berkeley Hills, California, the beautiful old house was built more than fifty years ago by Joseph Esherick - famous in San Francisco architect. George Homsey, who worked closely with Joseph Esherick, remembers that the construction of the house has begun for the sake of a single lady - Louise Nixon. She was a conservative nice woman who just wished to have a beautiful house. But, as the eighty-six-year-old architect from the state of California admits, this is not the whole prehistory of this wonderful house in Berkeley Hills. Homsey looks back to distant times when it was a pick of Joseph's carrier. At that moment his unsophisticated and, at the same time, one-of-a-kind houses were spread throughout the country and everyone knew his name. George also remembers young "headshrinker" Nixon from the Stanford University who was looking for a new house of an Asiatic style somewhere near Berkeley Hills. Designers from Esherick Studio offered her a model of T-shaped house in Japanese style. They also proposed to cover the roof with shingle, which was typical for the Berkeley region. It was supposed to become an attention-getting house near the down slopes of Tilden Park. The building was finally finished in the middle of 1950's. A fresh face of the Modernist American style, Lawrence Halprin, helped with landscape setting. He showed his vision of the eastern part of the house - meadow with a small runlet and a fascinating impoundment. Nixon married Louise in 1967 and had been living in that house for nearly fifty years. Unfortunately, they had no children. Nixon died in 2003, and, a year later, his grand-nephew Eric Gimon (a physical scientist, the Energy Department insider and Technical Advisor) with his wife, Emma (Philosophy Doctor of architectural engineering), purchased the house. They faced the only problem - the former house keepers lived there only two together and Gimon's family needed more space in the house as they lived there with a little daughter Louise, two sons and a dog called Nefi. Many people for one old wooden house, isn't it? So, the family decided to expand the territory of their new home. Emma admitted that they were worried too much about the process. They didn't want to destroy the architectural style of Joseph Esherick. Emma didn't much care about the landscape - she supposed, it was neglected and wasn't finished at all. So, at the beginning of the 2000's they decided to renew the landscape and make it so that it was combined with the overall picture of the house. Phil Kaefer, Benjamin Parco, Gary Roth and Kate Simonen helped the Gimons to implement their desire. Kate had worked on an idea of prefab additions at the beginning of 2000s. Few years later, she cooperated with architects Parco and Kaefer, creating new modular additions to existing home. And the landscape designer Gary Roth had also joined them. He had been working hand in glove with Lawrence Halprin until he died in the year 2009. They were discussing a lot of ideas that could allow the family extend their living space. At last, the command decided to remain the original idea of the house and to update the eating area, make a tremendous decking for Gimons to have a rest there. They wanted the family to finish their working day and come home where they, after having dinner in their new maple kitchen, will finally have a rest in their new immense deck which takes much space in the southern part of the common house area. At first, considering to rebuild their old house as soon as possible, Eric and Emma had faced with one problem - it was too insecure to lift a crane onto the top of the hill. They had decided that question very fast and erected the frame of the modular additions to existing home in a few days. What helped them? Walls were made of prefab panels, and unique butterfly roof, despite its big size, was pointed directly ahead. That let the architect team work with no fear to damage something. The building team had devised all parts of the modular additions to existing home the way that simplified its installing. They shifted lighting parts into big boxes, that had been placed then and there; moved electrical outlets right onto the floor and installed cordless and program-controlled light switches. Paying attention to the couple's preferences, it was known that the house owners honored environmental conditions they lived at. So, they made a decision to cooperate with the group of architects to build a modular additions to existing home with green components that will let them save their money. Heat pump was installed and electricity is generated with roof-integrated solar array. From the very beginning of the house rebuilding, there was set a goal to construct it much better than it really had been before. Architects stated that the concept had already grown out of its initial construction and customer preferences. Gary Roth explained that his team hadn't tried to jump off the original design and had been working with finished material, just keeping it up to date. Jens Risom, a famous furniture designer, has announced himself as a talented architect. Popular magazines were shocked to learn that he built a nice summer house for his family for less than $30 000, because previously they had written that it was impossible. He got in touch with one of the popular newspapers and said that he built such an inexpensive prefab frame house they couldn’t believe. Jens Risom tells that he has found the triangular prefab framing in catalog and brought it to Rhode Island to construct a prefabricated house there. Eventually, the block-modular building system has become more developed, since the post-war period the reputation of such houses was almost zero. Houses were built quickly and they were of poor quality. Jens Risom has proved that prefabs can be constructed due to new standards with wooden frames, an incredibly high ceiling and more other peculiarities. Having been worked for years as a designer, it was not that hard for Jens to create his home project. Risom was born in Copenhagen in 1916 in the family of the prosperous architect. He remembers with emotional warmth how he liked to spend his childhood with family in Denmark far from the urban bustle. He admits that his father, being the author of a book about house building, had a great influence on him and was the authority for him. His father often struggled with different situations when he couldn’t drive his project to the end. Jens, wishing to gain full control over his objects, suggested father’s struggles to be enormous. He tells with pleasure that he was always fond of design because architecture is the most elegant art he knows. After finishing the studies at the Royal Danish Academy of Fine Arts he began to gain experience in architecture, working for the architect E. Kuhn. Back at that time, Jens Risom began to think about designer career in the United States. He stopped his thoughts on modern furniture design. He stayed in Manhattan in search of appropriate conditions to start his own business. His first serious proposal became from Dan Cooper who was creating soft goods, being the reputable and well-known decorator. This proposal was not to the young and ambitious Jens liking, because he did not plan to focus his designer career on textiles. Sometime after that, he was allowed to demonstrate to the public some furniture designed by himself. This greatly increased the authority of Cooper. Risom’s talent was noticed right from the jump, for the reason that Cooper’s works were being performed in a quiet style for many years. Over a pretty short period of time Jens found his admirers and world designers began to learn about him and come to his shows. Jens has been working with Cooper for a few years and finally he had realized that he had no opportunity to control the whole process. For this reason he had separated from Cooper and became an independent unit in the design world. All the more authority he had acquired helping Hans Knoll to finish and represent society his first collection of furniture. The fate of the young designer was intervened by the Second World War without remorse. For several years he was serving abroad. After returning back to New York, he decided to continue his career all alone and start his own collection under his name. Jens’s popularity gradually began to move into top gear and by the beginning of the 60’s, people had come in scores to employ to Risom’s designer company. 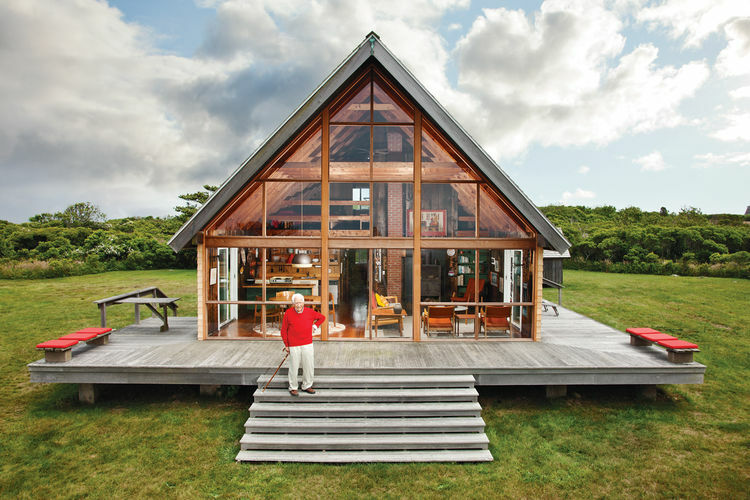 While living with his family in Connecticut, Jens was looking for the most comfortable place on Block Island to build a summer house to have a rest there. His wife with children preferred to spend summer in their rented apartment on the seaside and far from urban hustle, remembering how they lived in Denmark. Finally, after a couple of years, he found a convenient place for house construction in the North of Block Island. Before he started to build, he had been seeking out modules for his prefab frame house. He was looking quite long for the most fitted materials that could cost not too much and weather out wild winds, specific to Block Island’s area. At last, he found a respectful design and construction company in Wayland, Massachusetts. It has fulfilled all Risom’s requirements and wishes – cathedral ceilings, panoramic glass wall to let nature inside, wood surfaces with a soft shade and also 10 feet of extra territory. That’s all coasted him over twenty thousand US dollars. After all of the blocks and house parts had been ordered, he developed a design for the construction of his new home. When everything was thoroughly planned, he took care of the safe order transportation through Rhode Island to Block Island. The base of the house was slightly elevated. But it had been targeted so skillfully that no one would ever guess. It is well-known that the weather on the island is not so quiet as everyone wants it to be. Block Island is famous for its foggy moments when there is no allusion to fogs but in a short period of time, everything is covered with heavy mist and people cannot even see each other, staying quite close. These circumstances made the house being built five weeks longer than it was expected. Construction of the prefab frame house was completed in late spring and at the beginning of the summer Risom's family, finally, settled in a new home. However, they moved there not in a full complement, as daughters have been already living in their own homes. Only two small floors, but the lower one contains two bedrooms, bathroom and kitchen facilities, a living room and a dining room. Meanwhile, boys territory is on the upper floor. What a magical place to escape from the routine of everyday life! Indeed, from the end of spring and till the end of autumn (those were periods of time when Jens could escape from his work and stay with his wife and sons) Risom's family was spending time providing different kinds of activities - from fishing to bushwalks. From time to time, prefab frame house design was supplemented with new details; old parts were replaced with new, something had to be repaired after years that the family lived there. For instance, a building superintendent, John Spier, had helped to replace old glass parts that were rigidly attached to the wooden frame, to new parts that were not so dangerous as old ones. He admitted that to work with large glass was every time fearfully for him. He explained, that it always existed a risk that the glass would be broken to atoms and hurt him and would even make him bleed. But he knew that the new glass would be safer than the old one. Being 97 years old, Jens with his wife arrived to the Block Island to see their new glass in the frame. Jens admits that he always worried that his summer house would look too new when he wanted to change something in it. His son Sven wonders, how his father always managed to change something and to make it better than it really was. With a faint smile on his face, he tells that his father, being serious to his creation, is proud that he has made his family happy with their home. He felt that the inspiration came to him from the natural village lifestyle. Risom remembers that his life in Denmark was different from today's city life but it was so nice. Greg and Victoria met on a Montauk beach at first when they were teenagers. After many years they decided to leave Manhattan and to return to Long Island where together they wanted to build a sustainable house. The Hamptons hamlet is a perfect place for children during summer. And when they made a decision to have a dwelling where their family with sons, Lucas and Dylan, could escape from the busy city, they definitely knew where it should be. Paul Masi of Bates Masi Architects is a Victoria’s brother and they decided to work with him. 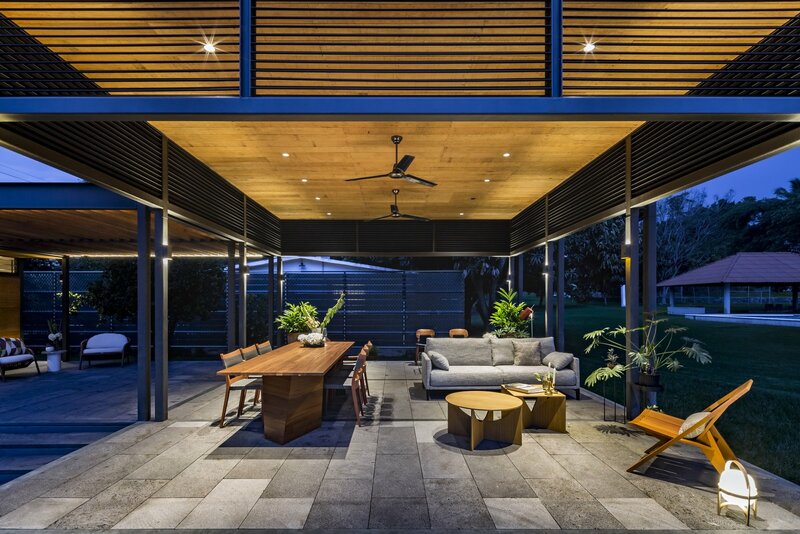 Masi designed a special house for his sister and for his brother-in-law; the main area of the house has a double-height; kitchen, living room and dining room are located in one space connected with outdoors with a large glass pocket doors. Victoria told that they didn’t want to separate the indoors and outdoors. The project was finished in 2008 after two years of works. The house is environmentally friendly; has a geothermal cooling and heating system and a prefabricated foundation. The family got as a result a beach house with the perfect design. During spring and autumn the space of living room, dining rooms and kitchen can be ventilated naturally as it opens on two sides. In summer the direct sunlight is prevented by an overhang and in winter the house has a lot of light and warmth, because it is time when the sun is low. There are two layers of aluminum woven-coil drapes outside the south-facing large windows above the living room. Due to drapes the house is kept from the overheating in hot months, but when the weather is cooler they allow the sun to warm the space. The texture and appearance of drapes are similar to fireplace netting; they are produced by Cascade Coil Drapery, an Oregon company, and made of recy­cled scrap metal. The company also supplies the hearth market. The house’s geothermal system is open-loop; this system uses 55-dergee temperature of the groundwater for cooling and heating the house. An exterior condenser was not need, as the needed equipment is in the basement utility room. Masi said that here the salt air corrodes them; so they didn’t want to have the condenser and they wanted use geothermal instead. There are several types of geothermal systems, to heat and cool house they use the constant temperature of Earth, in winter it is warmer than the open air and in summer it is cooler. What kind to choose and is it necessary to install one, depends on some factors. In the Pryors’ and in other open-loop systems the pipes draw water from the well into the house, then heat pump extracts heat or transfers excess heat to the water before its return to the ground. And in system, called closed-loop, there is some special solution in the pipes; this solution acts as a heat exchanger in buried under-ground pipes. If there is enough clean water that is supplied to the heat pump, an open-loop system is considered to be much more economical, because there is required less excavation. A pond-loop system has sub-merged pipes in a water. A horizontal-loop system pipes can be buried six feet in the ground. For not large houses, vertical-loop systems may be suitable, but the price of burying pipes deeper than 400 feet down, is pretty high. The main advantage of geothermal system is that it is more economical than air-conditioning and gas furnaces systems. And it is much more expensive. Every year the owners can save a lot of money, up to 60 percent. Also the upfront cost can be offset by the tax incentives. The foundation of structure is made of concrete insulated panels, which were produced by Superior Walls of Hudson Valley. They were shipped to the building site, craned and bolted together. There was no need for panels to be waterproofed or coated during building process, as the panels are made of water-resistant, dense concrete mix. Because of a prefabricated exterior walls could have excessively high price, the architects decided to change their plan. But the panels, produced at Cement Board Fabricators’ factory, were used as the rain screen. The prefabricated panels help the house keep comfort temperature by absorbing and transferring heat through gaps made for ventilation between the siding and panels. In the house Masi used finishes, which are low in toxic chemicals, such as formaldehyde and benzene, and volatile organic compounds. For painting the interior walls, there was used Benjamin Moore Aura matte paint. Osmo Polyx-Oil was used for sealing the American walnut floors, this finish includes thistle, soybean, and sunflower oils among its components. Have you ever thought about living in a beautiful, comfortable and eco-friendly apartment? What about a "house under the hill"? The construction of such an unusual property is a bold experiment, but it is fully justified. Dreams where you can forget about high maintenance fees may come true! Don’t you believe? Let’s check! The American company Green Magic Homes can offer you such a unique chance with modest prices – houses, made of high-quality materials and covered with vegetation. For example, a four hundred square foot earth-ship will cost you just about $14,000 US that is approximately $35 US per square foot. The company also proposes cheaper variants – belvederes that will cost a buyer only $25 US for a one square foot area. Though, this is a less viable option because of its open conception. But this variant also can be considered when choosing a suitable home for you. The modules of these Prefab Earth Sheltered Homes are made of lightweight and durable material – a composite laminate. It is easier than ever to compile your home because the modules are assembled from prefabricated panels, mounted on a flat surface. And then with the help of a drill they are linked together through special holes on the edges. You will be pleasantly surprised to find out that the modular structure of such houses allows home owners to assemble at first a small house and then successively expand your living space when it is needed. Green Magic Homes assures its clients that such facilities and equipment as sewer system, plumbing and wiring channels as well as air channels can be added at any stage of construction and the external coverage is wholly waterproof. Why not to plant greenery on the roof? When all modules are assembled, the walls of your house will be covered up with soil. Sooner, grass or flowers will grow out in that place. But there is also another variant of such houses. Walls and roof are built into the earth at the very beginning, so that there will be no need to cover the house with vegetation. 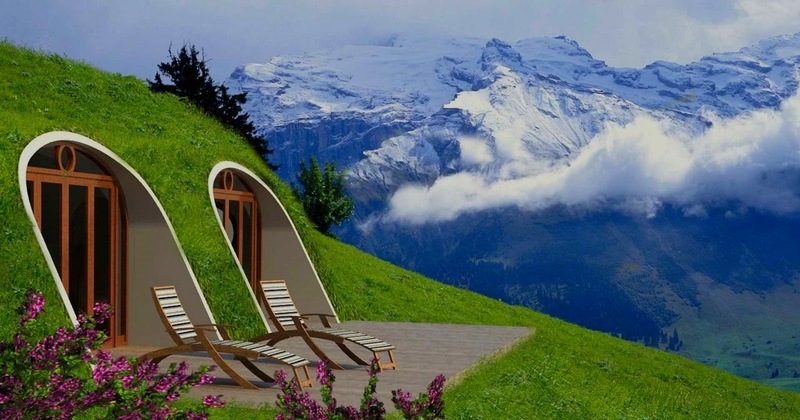 The well-known company from Florida, Green Magic Homes, offers everyone to feel themselves like hobbits. You need only to purchase there a modular home, resembling a "house under the hill", assemble it and cover up the top layer with soil. This bears not only an aesthetic burden, but also gives you a chance to save your money on utilities costs. Even in colder climates it plays a big role in reducing the cost of Prefab Earth Sheltered Home heating because soil and grass covering gives the excellent heat insulating properties. Green Magic Homes prefab technology allows you to generate varios spaces ideal for: permanent houses, camps, cabins, offices, hotel rooms, clinics, classrooms, health centers, lounges for meetings, covered parking, deposits, Gazebos, among many others more. Description from architects: "MINIMOD proposes an innovative, intelligent and sustainable alternative for dwelling, enjoying the benefits of the off site construction (OSC)technology, with no waste and no mess. The house has a modulated structure and design, which allows multiple configurations and customizations. Starting from a minimal module, MINIMOD invests in customization, design and sustainability. The production is carried out in a prefabricated manner and enjoys the steel frame system technology, which allows the client program definition needs and choice of finishes, as well as automation options. 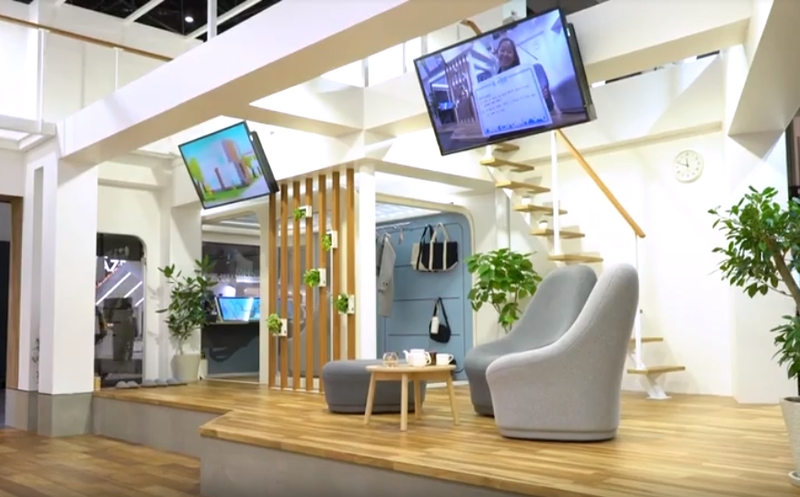 Depending on the composition of the modules, the MINIMOD offers different possibilities – ranging from a compact weekend retreat, a small show room for events up to larger programs and elaborated as hotels and inns, combining a larger number of modules. The modules are 100% prefabricated. MINIMOD than is take to any site by truck or disassembled into smaller pieces and taken to the ground for final assembly. This allows for a clean work without harming the natural environment. Importantly, the expansion and addition of new modules can be performed either at initial installation or in the middle of the process, according to the needs and budgets of the client. MINIMOD is more than a product of design, is more than a house. It’s practicality combined with comfort, it’s economy allied to nature, and it’s a unique experience of housing and contemporary living."